Kate had a home, but her heart wasn’t in it…or in her marriage. So she left them both. Phillis had a home…and her heart was in it…but she wanted something more. Naomi had no home and her heart was in cold storage, frozen by grief and fear. They found one another in a department store. The problem with ‘retail therapy’: you can overdose. A contemporary novel about women who want more. ‘I want to talk about the cover first – I really like it! It’s a very simple cover, an everyday scene that you might regularly see on a journey home in the evening. But that is what makes it such a brilliant cover – it is familiar, it is comforting, and personally, it made me smile, thinking of all the journeys I’d done with a beautiful sky like that. In Making It Home, we meet three women, who are all different but find a friendship in each other. They also find they have one thing in common: they want more from life. Can Kate, Phyllis and Naomi be happy with the life they have? Or can they find the courage to reach out for something more? I really liked this book! One of the things I liked most about Making It Home is that Christine has created three women who could be our best friend, neighbour, aunt and so on. The characters aren’t perfect women with flawless make up and rich husbands, instead they are real, true-to life women that all of the ladies out there will be able to relate to, and that is what makes this story so compelling to read! Personally I love when an author writes about real women, about the struggles and problems that real women may face everyday, and creates realistic scenarios that could be exactly like what the readers could be going through. I am certain readers will be able to relate to Kate, Phyllis and Naomi in some way, whether it is their personalities, their individual situations or the friendship that these characters have with each other. The characters were very well-drawn and written, I loved the friendship and the bond that the three women created with each other, ad I enjoyed reading and watching this friendship grow throughout the book. I was hooked to the characters individual stories and set of circumstances, I desperately wanted to know how they would progress and on many occasions I was cheering them on from my seat! I liked all three of the main characters but my favourite was Kate. In this book we meet Kate, who has a fairly normal life, but it is slowly unwinding like an old clock and she is beginning to realize that it is time for a decision about what kind of life she truly wants. Phyllis, an older woman who befriends Kate, helps open Kate’s eyes to how much she has been sleep-walking through her life. They both recognize that Naomi needs their help but they can’t quite work out how to offer that help or what all it will entail.So far it could be any politically correct book on the “women’s literature” market – but this book rises above that. The characters deepen and when men come into the story they start out almost as caricatures and then find their own realism as the women in the book begin to see them as real people with real thoughts and ideas. The people in this book stay with the reader and seem to grow even after the book concludes. It is a gentle read that sinks into your mind and soul and gently helps you change your assumptions about others.I am really impressed with this author and with this novel. I recommend it to anyone who isn’t looking for a cookie-cutter story-line. “Making it Home” doesn’t come at you with a message or a sermon; it simply shares the lives of the people in it and lets you decide for yourself. This book gives me the same peaceful experience I found reading D.E. Stevenson’s work – but updated for modern times. This is a contemporary novel that is of a genre different from what I usually read. Thus I read it for a change and was pleased at the way the plot unfolds.It is the story of three women: Kate who had a home but whose heart was not in it, Phyllis who wanted something more than her home, and Naomi whose life was frozen by grief and fear. They meet each other by accident, become friends, and felt they should help each other. On the path of discovery that life is much more than what they think, the author develops the plot in a superbly captivating manner.I enjoyed reading this novel, and I am sure that you too will enjoy reading this novel, provided you are used to reading in this genre. It sounds like a very interesting book. I would love to read it. I hope you do, Nelieta. It is available in English, on all the Amazon kindle sites all over the world,so, hopefully, you should be able to download a copy if you have access to one of them. I enjoyed your review of Anne Frank’s diary and would love to read the review you would do of Making it Home. Thank you very much! 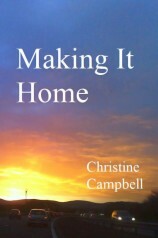 I found a copy of Making it home and hopefully I will be getting around to reading it shortly. Thank you, Nelieta. I shall look forward to hearing what you think of it. Yes, I was delighted to get such good reviews. I thought if I put a couple of them on here it might be helpful to potential readers.